Apple just announced a new version of its top-end music production software. 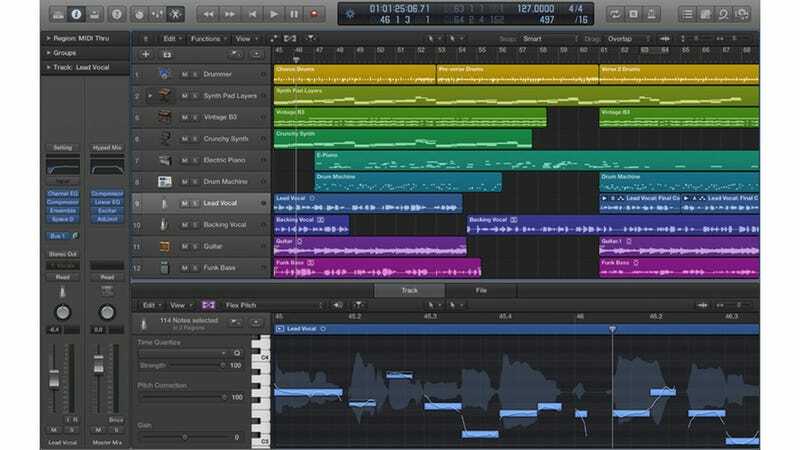 It's been four years since Apple updated its professional editing suite, so there's a long list of upgrades in Logic Pro X. The improvements range from an overhauled interface to an iPad controller app to a new automatic drummer feature to help fill in your song when you can't get a drummer into the studio. It's available now for $200. The first thing you'll immediately notice about Logic Pro X is a darker, more modern-looking interface. Beyond the cosmetics, the UI has been streamlined to make digging down into the nitty gritty of mixing easier. These days, most editing software comes with some kind of tablet control app interface, and given that Apple makes the iPad it's no surprise that the company made an iPad controller that should make naturally tactile actions like sliding faders up and down easier and more intuitive than they are with a mouse. The marquee feature is that automatic drummer (called, appropriately enough, "Drummer"). More than a metronome, it's designed to behave like an automatic session player that you can instruct using various tweakable parameters. According to Apple, Drummer is smarter and more human-sounding than your traditional drum machine. We'll be excited to see (and hear) how well it actually works.